It’s too easy to rip through ammo with an AR-pattern rifle. Let’s all admit it: no matter how expensive of optics and accessories we mount on our rifles, we really just want nothing more than to go cyclic at the end of the range session. Independence 55 grain FMJBT may not exactly be the cartridge of choice for mag dump. This rocket-hot load of 5.56X45mm is well suited for punching little holes into all kinds of things. This is XM193 ammunition which means it is functionally identical to MIL-SPEC M193 but did not make the cut to be labeled MIL-SPEC for whatever reason. Accuracy is trump to all other factors in shooting, period. This is why both MIL-SPEC 5.56X45mm NATO standard issue loadings are boat tail variety. These are designed to increase the ballistic coefficient and create a more stable flight. The military has long stressed the importance of consistent shot placement over all other factors, including larger chamberings. The M193 offers the best marriage of high accuracy with fragmentation over the infamous “green tip” M855. While offering improved penetration due to a steel core, the differences in all other factors are fairly minimal between the two. This is an excellent opportunity to buy first-rate ammunition in bulk to feed your hungry M4, Tavor, or whatever else is in your stable. It is a highly accurate load which moves with great swiftness and can be purchased in bulk. 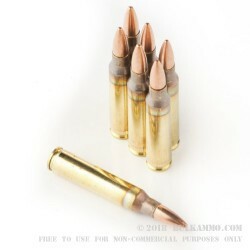 Good, hot 5.56 ammo for a good price! This stuff would work fine in tough times..... I'll be putting more back, if it goes on sale again soon. I got a good bit of this when it was going for around $165ish. If my SU16C burns through it. I'm glad I found bulkammo! Never an issue, Great Price!!! Ammo looks great, but will not cycle in my Adams AR..... No matter which setting on the gas block I set it at. Israelis did a hell of a job! I bought this ammo on sale so the price was good. I was using a Mossberg predator bolt action 5.56. Ammo was clean. No jams/misfires. Groupings were adequate but greater than 1.5". Couldnt really seem to get a good grouping. Maybe the gun doesnt like this ammo since others seemed to have good results. I will try in some of my ARS. I like the PMC XTAC 55g better. Sub 1". Q: Is this ammo non corrosive? A: Hello! 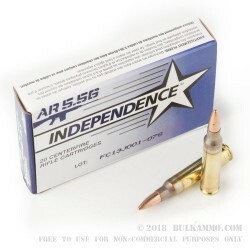 The Independence 5.56 ammunition is new manufacture and does not contain any corrosive components. A: Hello Alex! This ammunition is new manufacture. A: Hello Bill! This ammunition is loaded in brass cases with boxer primers and can most certainly be reloaded! A: Hello Jason, The listed ballistics for this round show a muzzle velocity of 3165 fps. Q: Where is this ammo produced? Posted On: 2/23/15 By: Hector Rodriguez Jr.
A: Hector, Independence ammunition is manufactured by the premier ammunition manufacturer for the Israeli Military, IMI (Israeli Military Industries). It is loaded into FC headstamped brass and imported and sold under the Independence name. A: Hello Jaime, Independence ammunition is loaded with a standard 55 grain copper coated lead core bullet. It does not contain any steel. A: Hello Josh! This Independence ammunition is loaded with an M193 projectile which is made with a copper coated, lead core. The projectile does not contain any steel. Q: This page says this ammo is FMJ-BT, yet the box in the picture says FMJ only. Which is it? A: The BT feature (Boat Tail) at the base of the bullet is considered a standard with this m193 round from Independence. While the manufacturer does not include this information, the bullets will feature a boat tail for improved accuracy at longer distances. The rounds will appear and function in your rifle as a traditional FMJ round will.